The Green Beauty, a Light Green Rose, is very seldom seen in nature. Green blossoms are seen as nature's beauty in physical form. Traditional they symbolize spring time, also as a symbol for many emotions such as hope, optimism, rejuvenation, fertility, copiousness, growth, life energy, self-respect, well being, transformation, soul, freshness. They have a very natural beauty that can be used for so many different occasions. They can accentuate the natural allure of spring and very green oriented events, such as Easter parties, spring graduations, and spring weddings. 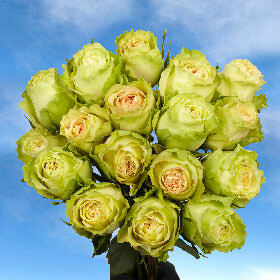 Light Green roses are even lovely enough to be corsages for that spring formal dance. All of our products are grown in the sunniest regions in Columbia. We have carefully selected these spots to insure all year round perfect climate so our flowers grow in the best of conditions. Since we grow all year round we are fortunate to be able to provide our customers with three-hundred and sixty-five days availability. We provide all of our continental USA customers free shipping provided by FedEx. Our greenhouses are not only in the best locations but are also some of the most advanced in the industry. When your order arrives at your doorstep do not be alarmed that they have arrived with their bulbs closed, your orders will need up to two to three days to fully bloom.